Ghosn: Partnerships, yes; mergers, no. 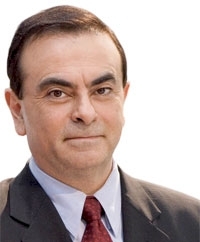 GENEVA – Renault-Nissan CEO Carlos Ghosn is still looking for another strategic partner to defray his global technology and vehicle costs. Rebuffed by General Motors more than three years ago and set back by canceled vehicle-sharing deals with Chrysler last year, Ghosn said here that he still wants to expand the Renault-Nissan alliance and pursue more partnerships. “Obviously, we are talking to many people. The name of the game is scale, co-investment and shared technologies. There are a lot of talks. You would be surprised how many people we are talking to about specific cooperations,” Ghosn said at the Geneva auto show. He declined to name potential technology partners. Partnerships on individual platforms or powertrains -- such as a rumored collaboration with Daimler AG on the next Smart car -- appear to be Ghosn's priority. He declined to confirm the Daimler talks. Earlier this week, Nissan Motor Co. also issued a statement denying press reports that it is involved in talks with Indian automaker Ashok Leyland Ltd. to co-develop a global small car. Renault S.A. last year considered becoming the source for future Saturn vehicles in a bid to keep that brand alive separately from GM. But Renault's management board passed on the plan, and Saturn is now winding down. Ghosn expressed concern that today's far-flung automotive empires lack the ability to cover all technologies and territories in a cost-efficient manner. “If you can find a third strategic partner, it gives you so much advantage,” he said. “The alliance is a group with a reasonable balance sheet and can afford a more aggressive strategy if we need to." He said it is “impossible” for smaller automakers to invest in areas such as electric vehicles, battery technology and ethanol, move into emerging markets like China and Russia, and also remain competitive in their existing markets. “Every car manufacturer cannot be everywhere. You divide your role. You move on the back of the infrastructure built on the back of your partner. We're going to have to have a lot of agreements between carmakers to make it happen,” Ghosn said. He said he was more concerned about how larger automakers, such as Toyota Motor Corp. and Volkswagen AG, are leveraging their volume, rather than individual threats from smaller players. Renault and Nissan sold about 6 million units globally last year, but there is “no magic number” for growth, Ghosn said. Ghosn's search for technology partners is especially true in the case of electric vehicles, which Renault-Nissan is investing in heavily. Ghosn wants to have 500,000 units of electric capacity -- divided among Europe, Japan and the United States within the next few years. Ghosn cautioned, however, that Renault Nissan is not looking for a merger.